Harriet Colfax was born in 1824 in Ogdensburg, New York, a town on the St. Lawrence River looking over into Ontario. As a young woman, she taught voice and piano in her hometown. In the early 1850’s, Harriet moved west to Michigan City, Indiana, with her younger brother, Richard Wilson Colfax, who became editor of the Michigan City Transcript, a Whig journal. (Richard died just after his twentieth-sixth birthday in February 1856 and is buried in the town’s Greenwood Cemetery.) Some sources say Harriet worked at her brother’s newspaper as a typesetter, then taught school. She never married, and after her brother’s death had few means of support. So by 1861, when she was thirty-seven, she decided to do something totally different. And the job would bring a house with it. Until the 1890s, being a lighthouse keeper was still a political position, relying on appointments and sometimes even corruption. On the Great Lakes and Atlantic Coast, these jobs were scarce and hard to come by. Fortunately, Harriet had a relative who could pull some major political strings. Her cousin Schuyler Colfax, born and raised in New York City, had also moved out to the promising new Hoosier State, where by age 19 he was editing the South Bend Free Press. 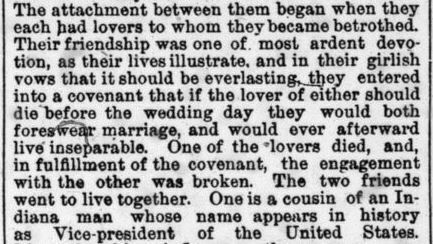 (In 1845, as the paper’s new owner, he changed its name to the St. Joseph Valley Register.) 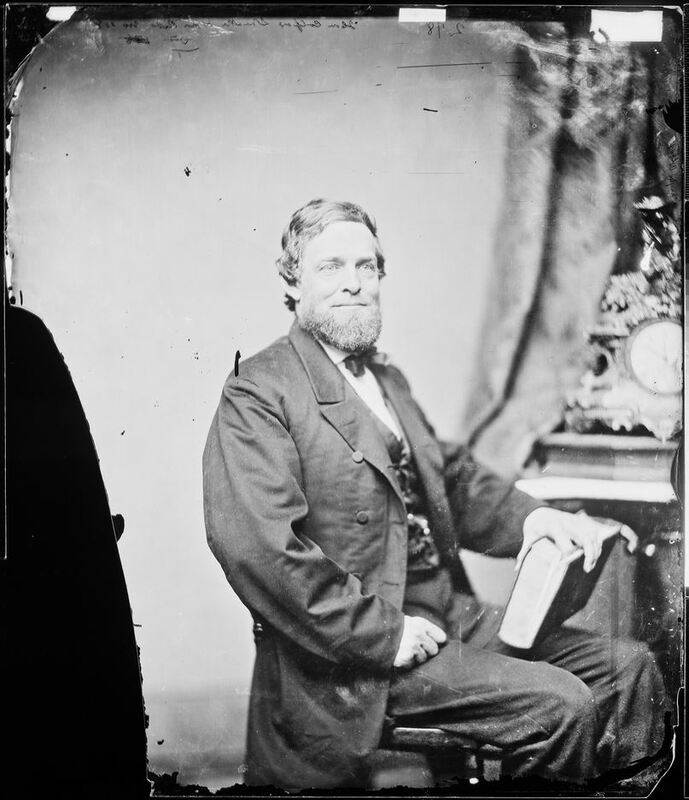 In the 1840s, Schuyler Colfax wrote about Indiana politics for the influential editor Horace Greeley’s New York Tribune and as State Senator wrote for the Indiana State Journal. In 1855, he got elected to Congress, where he spoke out against the extension of slavery into the West. Nicknamed “The Smiler” — partly for his affability, partly for his intrigue — he was also one of the few people you ever see grinning in 19th-century photographs! 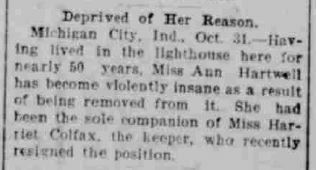 In March 1861, two years before he became Speaker of the House, Harriet’s cousin got her an appointment as the keeper of the Old Michigan City Lighthouse. Contemporary accounts constantly referred to Harriet as small in stature and rather frail, so her cousin in Washington, D.C., might have had to exert some pressure — or selectively leave out that information — to get the family favor done. Yet getting a post as lighthouse keeper wasn’t necessarily hard. If we can believe one of his letters, in 1822 the English actor Junius Brutus Booth, father of John Wilkes Booth, was offered the position of lighthouse keeper at Cape Hatteras on North Carolina’s remote Outer Banks — a job he almost accepted. This photo from July 20, 1914, shows the Old Michigan City Lighthouse after it was converted into a duplex for the lightkeeper’s family and his assistant. The tower and lantern dating from 1858 were removed. U.S. Coast Guard photo. Harriet Colfax also tended the East Pier Lighthouse, which required a perilous walk down a long, icy causeway in winter. 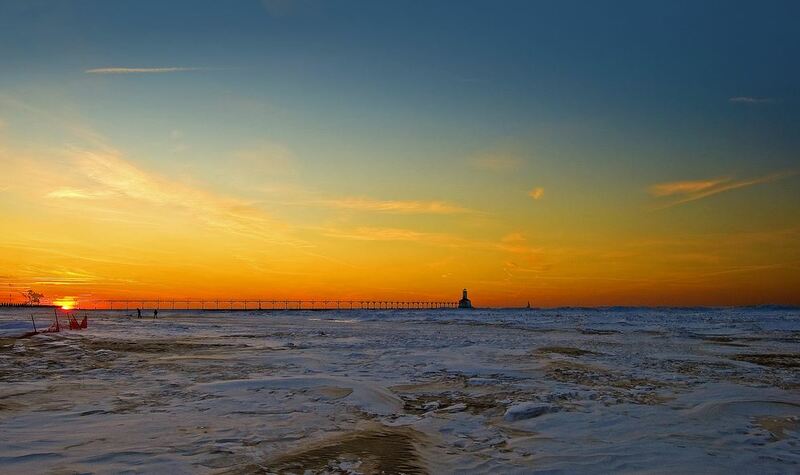 The light is situated at the end of the breakwater at the mouth of Michigan City harbor, once a minor fishing and lumbering port. Flickr Creative Commons photo, Tom Gill. Terre Haute Saturday Evening Mail, January 19, 1895. 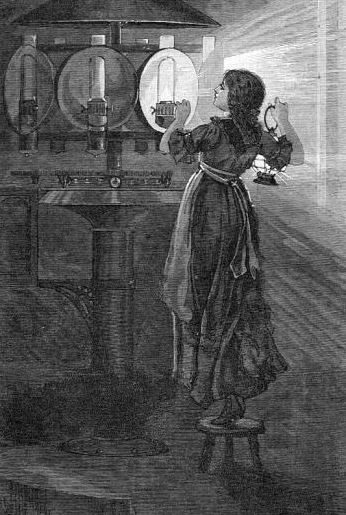 In the opening year of the Civil War, with her new appointment in hand, Harriet moved into the three-year-old lighthouse built among cottonwoods and willows by the Lifesaving Service just back from the harbor. 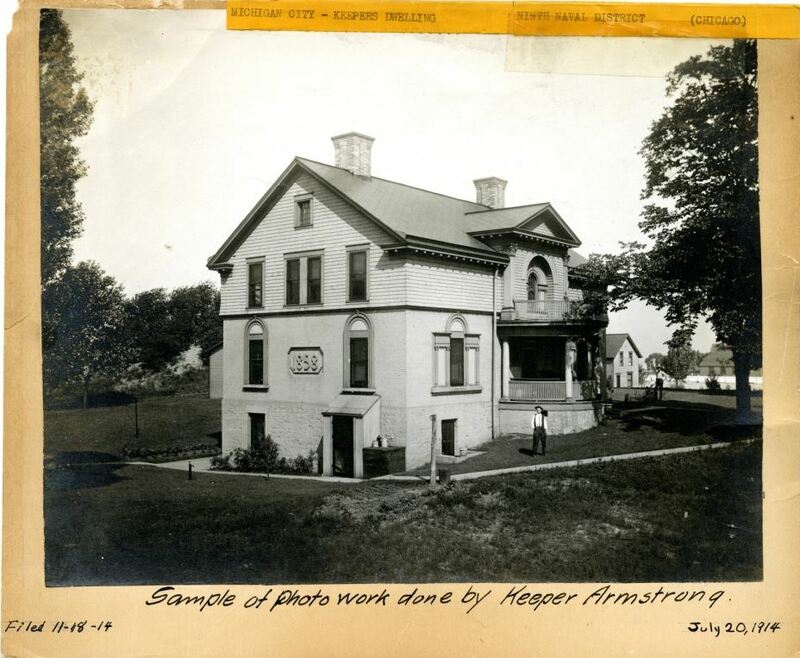 (The plan was almost identical to two other light stations — Grand Traverse Light on Michigan’s Leelanau Peninsula, and the station at Port Washington, Wisconsin, north of Milwaukee.) A new Fresnel lens up top was visible for fifteen miles out on Lake Michigan. Harriet Colfax had become the newest guardian of sailors along the occasionally storm-wracked Hoosier Coast. She kept the difficult job for forty-three years. The lard oil would get hard before I could get the lamp lighted, but once lit it never went out, you may be sure. My lights never went out till I quenched them myself. . . I love the lamps, the old lighthouse, and the work. They are the habit, the home, everything dear I have known for so long. I could not bear to see anyone else light my lamp. I would rather die here than live elsewhere. 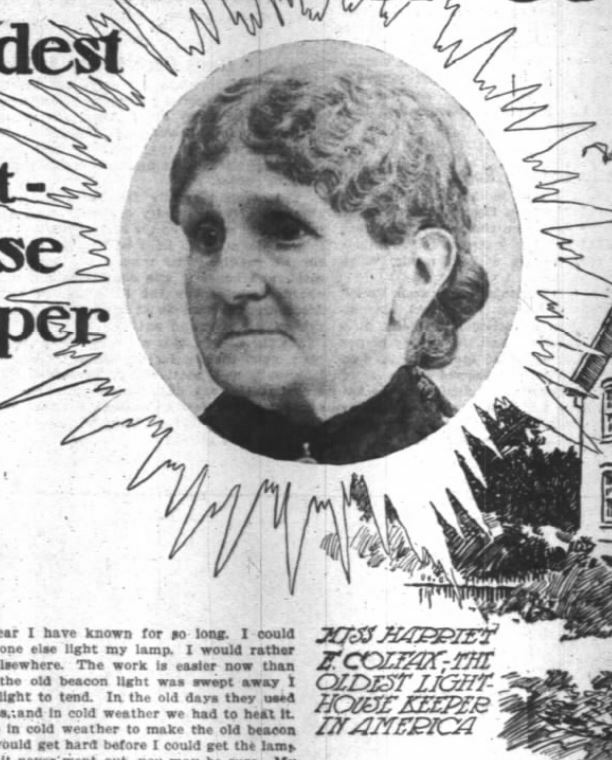 Harriet Colfax’s job, of course, wasn’t all hardship. Life on the lake had plenty of attractions. In her journals, she described spectacular rainbows and eclipses of the moon over the water. Winter’s icy grip brought impressive displays of the Northern Lights. And she sometimes got leaves of absence. In 1876, she visited the Centennial Exposition in Philadelphia. Ann died just a few months later, on January 22, 1905, aged 77. John Hazen White, the Episcopal Bishop of Indiana, presided at her funeral at Michigan City’s Trinity Cathedral. Harriet, also struck with grief at the loss of her home and long-time companion, passed away on April 16. The two are buried next to each other at the Greenwood Cemetery. Their names shine bright on the long list of women lighthouse keepers of the Great Lakes. 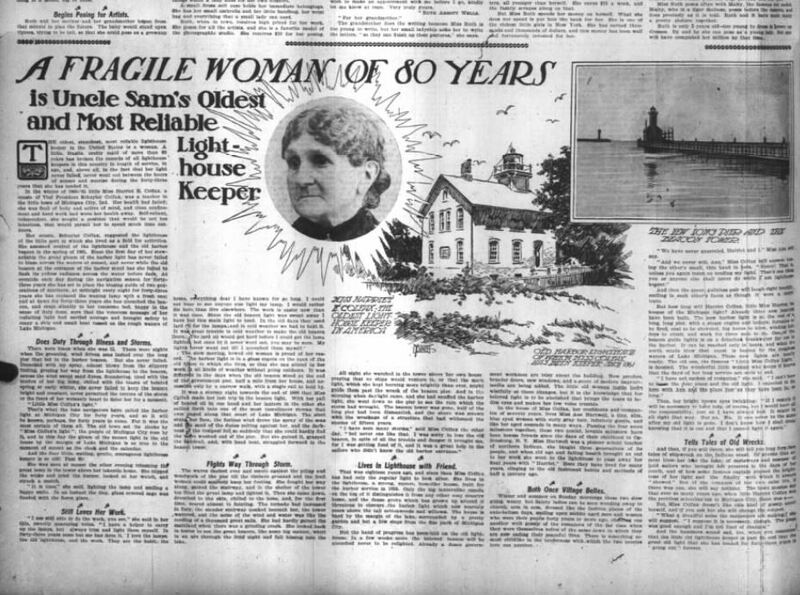 But lest you think that Harriet’s story is impressive, here’s one even better: Kathleen Moore, keeper of the Black Rock Harbor Light on Long Island Sound in Connecticut, was credited with saving twenty-one lives. She retired in 1878. Claims about her age differ, but Moore was born sometime between 1795 and 1812, took up lighthouse keeping before she was a teenager, and died in 1899. You do the math! Chicago Daily Tribune, October 2, 1904.